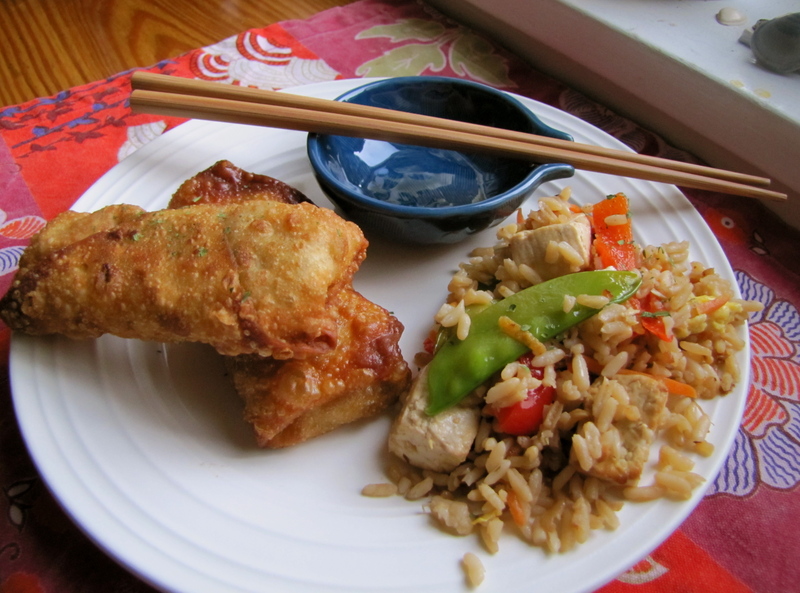 Tofu Fried Rice and Vegetable Egg Rolls – Voila! The Month of Vegetarianism continues and this dish is one of our favorites so far. It is super simple to put together and even easier to devour. The stir fried vegetables can be whatever combination you want. The possible varieties are infinite! I went for variety, color, textures and shapes. The egg rolls are also surprisingly easy to make. Similarly, you add whatever thinly cut veggies you want inside, fry and eat! I’m still looking for a good egg roll dipping sauce recipe…suggestions? I feel that as we explore vegetarian eating I’m also exploring more pan-Asian and Indian dishes, and what’s not to love about food from that part of the world? Stay tuned as our vegetarian experiment continues! 1. Cook rice the night before. Store in fridge, covered. 3. Heat 1 T. canola oil and 1/2 tsp. sesame oil in wok over medium heat. Add eggs and fry until egg is cooked all the way through. Remove from heat and place eggs on plate. Cut into strips or chopped and set aside. 4. Add another tablespoon of canola oil. Add shallots and garlic. Cook for about on minute. Add the rest of the veggies. Cook a few more minutes until soft. 5. Add rice and stir to combine. Add tofu. Sprinkle with salt. Pour in soy sauce and sesame oil and stir. Add eggs. Cover wok and place on low heat or off to keep warm. 3. Using a spatula, CAREFULLY place egg rolls in hot oil and fry for 1-2 minutes per side. This happens really quickly so keep an eye on these. When the egg rolls are golden brown all around, place on paper towel lined plate to soak up some grease, then serve immediately. 4. Put the fried rice and egg rolls on a plate, garnish and serve! Sweet Chili Sauce for the egg rolls. Its usually in the ‘international’ part of the grocery stores. Sriracha sauce! Which is quite frankly good on almost every (savory) thing.